Be it a patio garden or a small little deck, a sitting arrangement under a pergola or a well maintained outdoor barbecue stand, backyards are no longer just a place inside your home boundary, it has become an extended part of your functional area. This has become a place you can unwind and relax after a hectic time. Creating your ultimate backyard getaway needs a little bit of attention and a proper planning. 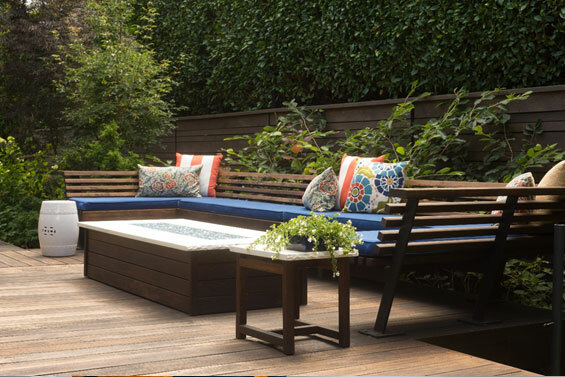 If you are looking to have a space where you can relax in peace, or to party outdoor, or want to do a little bit of both, there are ways that can add up to its functionality. Wood deck vs. composite deck: Consider the material for your deck. Wood is less costly but requires a lot of maintenance, on the other hand, composite deck is more costly than the wood but it requires annual cleaning only. Stain: If you choose to have a wooden deck, expert advice is to use a stain to protect it from the elements. Oil based products, transparent or semi-transparent, are considered to be the best one. Raised deck vs. ground level: Consider your budget and style preferences and decide if you want to have a raised deck or a ground level deck. You can also add another one or two level on the deck to have the view. Give a proper thought on the vibe you want your outdoor space to give and accessorise accordingly. That doesn’t necessarily mean you need to spend heaps on accessories and decors. You can easily recycle and reuse furniture and decorative items that you already have. Keep it simple: You don’t need to install luxurious elements to give your outdoor THE look and feel. Because you want to relax and be in calm, simple, subtle arrangements will serve the purpose. If you think your backyard is missing the flare, you can always add colourful mini decorations or flower plants to jazz it up. Keep it cosy: Keep your comfort as the top priority when arranging the furniture or decorating it. Your place should feature your favourite creature comforts, like plush pillows, and lightweight throws. Plan it in a way so you can have your perfect me-time whenever you need it, be it any time of the day. Consider the lighting arrangement. Keep it lush: You can enhance your outdoor space by adding flowers and greenery. It will inject colour and fragrance to the whole environment. You can also create a vegetable or herb garden in pots. Before going for either option, you need to do your homework and learn about the local building codes. Just watching some DIY videos will not help you in this case, you need to have the proper skill and the kit. Do some self-assessment and measure up how big your specific project is. Then decide if you need help on the project or you are efficient and skilled enough to create the safe haven yourself. Best wishes on your project, and feel free to contact our expert team if you need any kind of help.